At House of Mirrors and Glass, one of our favourite things to do is help Calgary designers find the perfect mirror for the home they’re reimagining. Whether they’re working with a Calgary homeowner to reorganize a small entry or updating a newly renovated washroom, mirrors always play an important role in creating beautiful, function spaces. Here are just a few ideas for how to use mirrors to complement your home’s decor. While Calgary homes have certainly gotten bigger over the decades, many houses still have a few tight spaces. Maybe your entryway is a little cramped, or perhaps your powder room feels claustrophobic. Going big with an oversized mirror can help to brighten the space and visually expand its borders. For a small, main floor washroom, which mostly serves as a convenient toilet, we suggest that you ditch the medicine cabinet. Your toothbrushes are upstairs anyways! Instead, buy an oversized mirror with a bold frame which takes up most of one wall. For an entry or other small room, lean a tall mirror against the far wall. Measure to make sure the mirror will span up at least three quarters of the way to the ceiling, and choose an eye-catching frame to ensure it becomes the focal point of the room. You’ll be amazed by the seemingly magical space-expanding properties of your new mirror. The perfect companion for a jack and jill bathroom may seem like a single mirror that spans from the first vanity to the second, but this look can feel a bit commercial. Since no one wants to feel like they’re flossing in a public bathroom, using two smaller, mismatched mirrors is the perfect solution. Simply come by our showroom with your partner, and both of you can choose the mirror and frame that speaks to your individuality. For the best effect, try choosing mirrors of different shape (one rectangular and one round, for example) and frames of different colours. 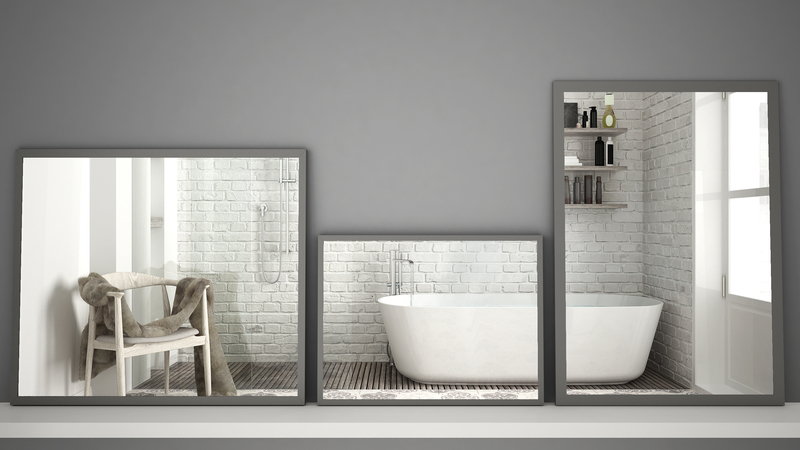 The contrasting mirrors and frames will create a wonderfully interesting focal point in your bathroom, without compromising functionality in the mornings. When it comes to reimagining your space, remember to consider how mirrors will fit into each room. These beautiful, sleek design features can offer both classic antiquity and clean modernity, giving you the flexibility to juxtapose or complement furniture and architectural character. Come by Alberta’s largest mirror and glass showroom to find the perfect fit for your home, or if you have something really special and unique in mind, talk with one of our experts. It would be a pleasure to craft your custom creation.